BOSTON, Massachusetts, USA -- Thursday, July 25, 2013 -- The Free Software Foundation (FSF) today launched a fundraising initiative for Replicant, a fully free Android distribution and the first mobile operating system (OS) to run without relying on proprietary system code. Replicant's small volunteer developer team is focused on improving their OS, while also expanding it to work on more devices. Donations will primarily be used to buy new devices for development and testing -- a critical need -- but will also help fund infrastructure and promotion for the project. The FSF's previous purchase and donation of a Samsung Galaxy Tab 2 allowed the project's developers to support the tablet, but adding support for a new device requires between $400 and $600 in donations for hardware costs alone. Each device that this long-term fundraising program is able to provide is likely to allow thousands of users of that device to run a free mobile OS for the first time. Supporters are making these contributions at the FSF-hosted page for the campaign. While most of Android is already free software, device manufacturers distribute the OS with some key nonfree parts. Those parts are in the layer of Android that communicates with the phone or tablet hardware, such as the WiFi and Bluetooth chips. In addition, every commonly available Android device comes pre-loaded with a variety of proprietary applications running on top of the operating system. Replicant seeks to provide all of the same functionality using only free software. Users of Replicant have a full suite of free software mobile-optimized applications at their fingertips through F-Droid, Replicant's default app repository. F-Droid isn't just for Replicant -- it works on all Android-based systems, and the FSF recommends it as a replacement for Google Play store. FSF executive director John Sullivan, who has been using Replicant on his primary phone for three years, said, "Mobile operating systems distributed by Apple, Microsoft, and Google all require you to use proprietary software. Even one such program in a phone's application space is enough to threaten our freedom and security -- it only takes one open backdoor to gain access. We are proud to support the Replicant project to help users escape the proprietary restrictions imposed by the current major smartphone vendors. There will still be problems remaining to solve, like the proprietary radio firmware and the common practice of locking down phones, but Replicant is a major part of the solution." The Replicant project was founded in 2010 by Aaron Williamson, Graziano Sorbaioli, Denis "GNUtoo" Carikli and Bradley M. Kuhn, to unify the efforts of various individuals attempting to produce a fully free Android distribution. Most of the recent development has been done by Carikli and Paul Kocialkowski, both of whom have been instrumental in developing the project's relationship with the FSF. Kocialkowski said, "For a long time, it wasn't possible to operate a mobile phone using free software, even though that is one of the areas of computing where the most important issues are at stake. 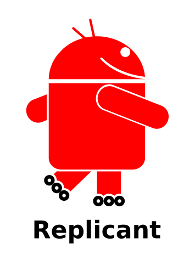 Replicant is a free Android derivative, while other Android versions usually require nonfree components to actually run on phones. We expect that having our project supported by the Free Software Foundation's fundraising program will greatly help the project, particularly by enabling us to build support for more phones." As of its 4.0 0004 release on July 22nd, Replicant works on ten devices, including multiple phones from the Samsung Galaxy S line and tablets from the Samsung Galaxy Tab line, as well as the Google Nexus S.
In addition to funding, the Replicant project needs developers, and is listed on the FSF's High Priority Projects page. Hackers interested in working on Replicant or those with questions about the project should introduce themselves to the IRC channel, #replicant on irc.freenode.org, and the mailing list. Developers interested in porting Replicant to new devices should visit the project's wiki to get started. Supporters can also help by installing Replicant and submitting bug reports to the developers. The fundraising campaign is part of the FSF's Working Together for Free Software initiative, a broad campaign to connect software freedom advocates with projects that need their help. Other projects that have benefited from this program include the web media-publishing platform GNU MediaGoblin and the GNU Octave mathematics and data manipulation package. You can unsubscribe to this mailing-list by visiting the link https://crm.fsf.org/civicrm/mailing/unsubscribe?reset=1&jid=128037&qid=4595246&h=5558d6b4769b40c8.